A very Happy New Year to everybody, it's almost impossible to believe that 2015 has arrived. But, London keeps going and, with the winter still upon us, it's great to get out and about and see London when it's not as busy as at other times of the year. So, to that end, the January list focuses on some intriguing locations that, although you can visit them at any time of the year, it might be an idea to get out and see them before the hoards return! I've been raving about the impending opening of the Walkie Talkie building viewing platform on the walks for the last few months and, I'm pleased to report that this has now come to pass and it opened to the public on 5th January 2015, so that is top of my list for this month. Since it is still winter I've tried to focus on indoor pursuits (there's a great little pub on this months list). Don't forget that I also post updates on our Facebook page, so you might like to join us and like us (as in Facebook likes!) to ensure you're kept fully up to date on what's happening in London during the weeks ahead. As ever, if something changes in the near future, I put the details on the Facebook Page, that way I won't be bombarding you with emails. So, without further ado, here is my January list of ten things to do in London. 20 Fenchurch Street. The entrance is in Philpot Lane. The Nearest Underground Station is Monument. This one is already proving popular and the system is, apparently, struggling to cope with the demand for tickets. 20 Fenchurch Street, or to give it its more popular nickname The Walkie Talkie Building, has elicited mixed reactions as it is, to say the least, a prominent City of London building. Several wags have commented that the rooftop view is worth it because it's about the only place in the City where you can't see the Walkie Talkie Building! Love it or loathe it, it is a free viewing platform (although advance booking is essential) and it offers uninterrupted views of the City of London below. Compare that with the almost £30 per person to go up The Shard opposite and a trip is well worth it. I just find myself wondering how long it will be before the flow of eager visitors leads them to introduce an admission charge to "ease the congestion", or am I just an old cynic? The Nearest Underground Station is Chancery Lane. Imagine an Aladdin's cave crammed full of more silver than most of us could focus on in a lifetime. Well, to be honest, you don't even have to imagine it as you can experience it in these wonderful subterranean vaults beneath Chancery Lane. From the massive, and well fortified, safe door you pass through to enter, to the shops themselves, where your eyes are dazzled by the array of glitter that greets them, you really will find yourself entranced by this underground treasure house. You can, if the mood takes you, buy quality antique English silver at competitive prices and you might even encounter the odd rock star and, even odder, Hollywood actor, shopping for that elusive something - to add to their other elusive somethings - from the 30 specialist shops found within in its glittering depths. Carter Lane is a non descript thoroughfare that stretches from Strand down to Embankment and which, as it descends, passes the service road for the Savoy Hotel where, incidentally, Bob Dylan filmed his Subterranean Homesick Blues footage. On Carter Lane's Strand corner is located the Coal Hole Pub, a delightful hostelry in which to steady your nerves for the confrontation with the emissions of.. well, err, Londoners. Because, half way along Carter Lane on the right is the only surviving gas lamp of the variety that was once powered by the gas from the sewers that Sir Joseph Bazalgette laid beneath the streets of London in the latter half of the 19th century. How's that for natural gas? Dating back to the 1540's, and tucked away in a very narrow alleyway off Hatton Garden, Ye Olde Mitre Tavern is as timeless a London hostelry as you could ever wish to encounter. 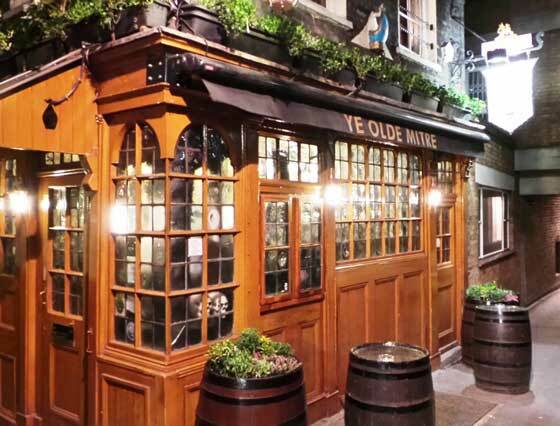 Not only is it London's most hidden pub, but it's also one of her smallest, with just two tiny bar rooms on the ground floor into which customers cram to enjoy one of the best pints in London and toasted sandwiches to die for! Opening Times:- Usually Open 11am to 3pm Monday to Friday. This is a fantastic City of London church and a visit is rewarded with all manner of fascinating things and memorials to look at. Hidden behind a column on the right as you make your way up the aisle, you will find a battered old hand bell. 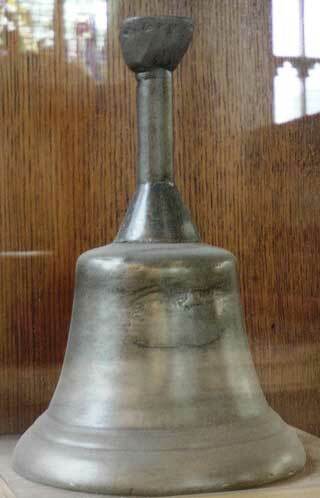 This is a replica of the bell that the bellman of the church used to take through the tunnel - the bricked up entrance of which can be seen in the wall to the left of the bell - to make his way to Newgate Prison, which used to stand opposite the church, on the eve of an execution to wake condemned prisoners and warn them that the end was nigh. One point of interest about the main bells of the church is that they are featured in the nursery rhyme Oranges and Lemons as the bells of Old Bailey that chime out with "when will you pay me," a reference to the fact that executions used to take place in the square opposite the church thus the payment to these bells was to be executed! King Charles 1st was executed outside the Banqueting House of Whitehall Palace on 30th January 1649 and, since the 19th Century, The Society of King Charles The Martyr has honoured the feast of St Charles with a service of commemoration at the Banqueting Hall. Wreath laying and prayers take place near the place of the martyrdom at 11.40am and there then follows a High Mass and sermon at midday inside the Banqueting House itself. The Society's relics of St. Charles are placed upon the altar for the Mass and may be venerated and viewed after the service. This is a true treasure chest of literature and, if you've never visited this wonderful free galley, you've missed one of London's highlights. You can admire an original of the First Folio of Shakespeare's plays; wonder at musical materials ranging from Handel to the handwritten lyrics of Help, penned by The Beatles themselves. There are works of literature from the likes of Charles Dickens to Jane Austen to the handwritten original of Alice in Wonderland that was given to "Alice" herself, the girl who was the inspiration for the story. The list goes on and on, and you could easily while away a few winter hours inside sheltered from the bleak mid winter without! The only thing missing is that Magna Carta is currently off display, but that's all the more reason for a second visit! Tuesday to Friday, 10.00 am to 4.00 pm. To avoid disappointment, please contact the church in advance if you are travelling some considerable distance. For many centuries the little church yard in front of the church of St Magnus the Martyr provided the main City side access onto old London Bridge. The church itself is an absolute joy to visit, not least because inside you can find a scaled down model of Old London Bridge, resplendent with the houses and shops that once spanned its length across the river. This intriguing exhibition offers visitors an enticing opportunity to explore "the darker side of life in the capital." You'll be able to catch a glimpse of the "The Beautiful Tiger Lady", "The Giant Yorkshire Youth", and the grisly "mermaid" that was displayed at the Turf Coffee House in 1822. There's even an opportunity to see a book from a London shoe merchant that records the outline of Boris Karloff's feet. And, lest all that proves insufficient enticement to lure you across the threshold of this magnificently macabre exhibition, how about the chance to examine the plans for the Primrose Hill "Pyramid of Death", an early 19th century proposal for a 94 stories high pyramid that would house the mortal remains of five million Londoners! Admission is free but donations requested. This lovely little church is often described as being Sir Christopher Wren's "dress-rehearsal" for St Paul's Cathedral, and the interior is truly exquisite. In 1953 the then vicar, Chad Varah, established the Samaritans at the Church and the original phone is still on display inside. 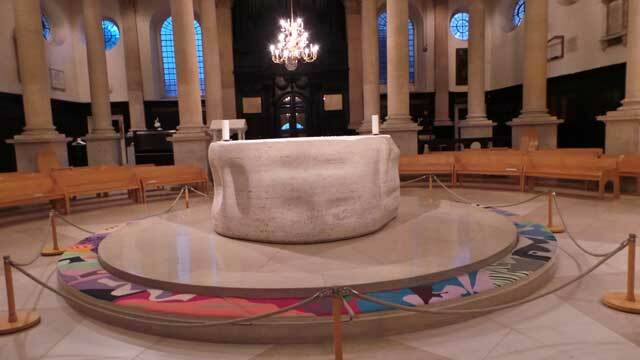 It was Chad Varah who was instrumental in persuading the sculptor Henry Moore to carve the church's centrally placed altar, a true focal point, both physically and spiritually, which was made from travertine marble cut from the same quarry that provided the marble for Michelangelo's work. So, there are many reasons to pay the lovely church of St Stephen's a visit. Saturday 7th February 2015 is Charles Dickens 203rd birthday and, to celebrate, Richard will be donning his Victorian outfit and conducting a costumed guided walk through the streets and alleyways of Victorian London that are still just as they were in Dickens day. This film, showing Londoners preparing for another night under attack during the London Blitz, is a true gem from the archives, and the matter-of-fact way that they go about their business at close of day, knowing what lies ahead over the next few hours, still elicits feelings of general admiration.